HANOVER, N.H. - The University of New Hampshire women's ice hockey team won its fourth game in a row as juniors Nicole Dunbar (Coto de Caza, Calif.) and Taylor Wenczkowski (Rochester, N.H.) both tallied goals in the second period. Senior captain goaltender Kyra Smith (Littleton, Colo.) made 31 saves in the Wildcats' first shutout of the season. Her record is now 5-4-1 on the season after starting the last seven games for New Hampshire. The Wildcats play their last home game of 2018 on Saturday, December 8 at 2 P.M. as they host the Harvard Crimson. For tickets, visit UNHWildcats.com or call (603) 862-4000. Date: Dec. 4, 2018 - 7 P.M. Location: Thompson Arena - Hanover, N.H.
- The Wildcats and the Big Green skated to a scoreless tie after one period with Dartmouth leading the shots on goal, 13-9. - UNH went on the power play 1:35 into the second period, and took just four seconds for Nicole Dunbar to deliver a strike from straight on through traffic. She received the first faceoff of the power play from Carlee Turner (Scottsdale, Ariz.) and put it home. - The Wildcats would extend their lead 7:54 into the period on an evens strength goal from Taylor Wenczkowski. She received the puck on the right side boards from Meghara McManus (Milton, Mass.) who was pulled down on a Dartmouth hook. Wenczkowski took the puck off McManus' deflection and took it right to the net, where she scored on the delayed penalty, off the right post and in. - UNH faced a 4-on-4 with Dartmouth's goaltender pulled for the final minute but held on for the victory. - In UNH's last four wins, Taylor Wenczkowski has tallied two points, including a goal in the last three. - The Wildcats are now 38-12-4 all-time against Dartmouth. - New Hampshire now has a 5-3-1 record when they score at least one power play goal in the game. 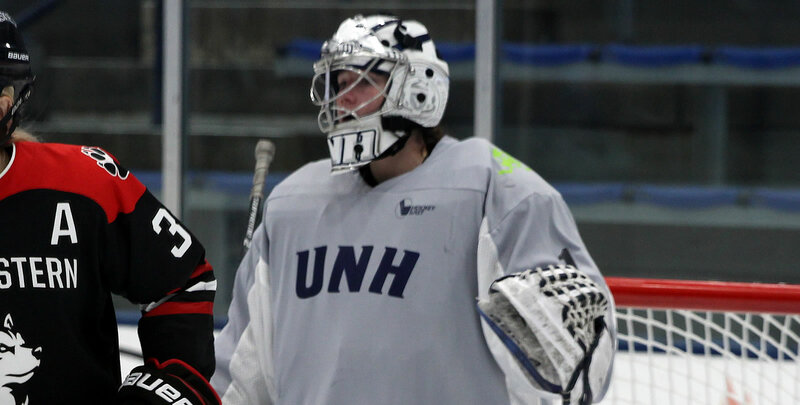 - The shutout was UNH's first of the year, and Kyra Smith's third career shutout. - UNH's last shutout was January 20, 2018 against Providence (1-0 win). - Smith's last shutout came on December 8, 2017 against UConn (3-0 win).